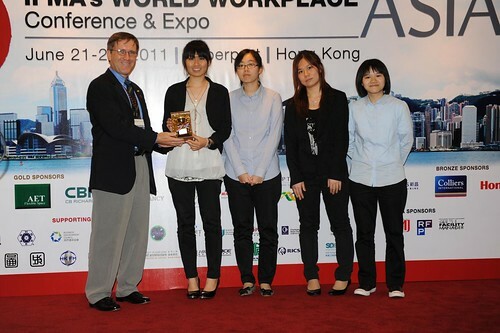 In support of World FM Day, the Hong Kong Chapter of IFMA organized a competition held as a component of IFMA’s World Workplace Asia Conference & Expo hosted in conjunction with the International Facility Management Association. The Inter-Institutional Competition for Best Facility Management Project Presentation was organized to encourage FM students to be more involved in the facility management industry and each student was nominated by his or her university/college for participation. Each student team presented a 10-minute presentation to a panel of five judges. Awards were provided to the top four teams, with all participating students receiving a certificate of merit. In addition, the Hong Kong Chapter of IFMA is providing each participating student with a one-year student membership to IFMA. Watch the winning students obtaining their Certificate of Merit.